Can a girl in the lingerie racket keep her decency even while she sheds her clothes? How can a business-woman get ahead? 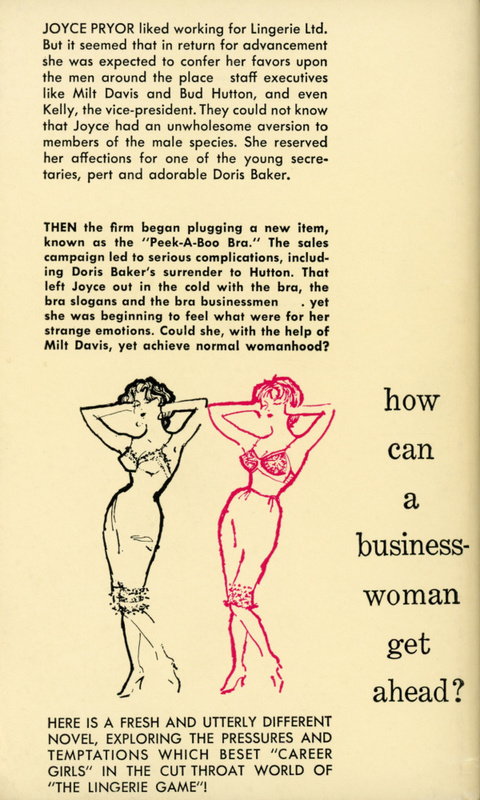 Joyce Pryor liked working for Lingerie Ltd. But it seemed that in return for advancement she was expected to confer her favors upon the men around the place staff executives like Milt Davis and Bud Hutton, and even Kelly, the vice-president. They could not know that Joyce had an unwholesome aversion to members of the male species. She reserved her affections for one of the young secretaries, pert and adorable Doris Baker. Then the firm began plugging a new item, known as the “Peek-A-Boo Bra.” The sales campaign led to serious complications, including Doris Baker’s surrender to Hutton. That left Joyce out in the cold with the bra, the bra slogans and the bra businessmen . yet she was beginning to feel what were for her strange emotions. Could she, with the help of Milt Davis, yet achieve normal womanhood? HERE IS A FRESH AND UTTERLY DIFFERENT NOVEL, EXPLORING THE PRESSURES AND TEMPTATIONS WHICH BESET “CAREER GIRLS” IN THE CUT THROAT WORLD OF “THE LINGERIE GAME”!